Argentinosaurus huinculensis ("Argentine reptile from Huincul") is a species of gigantic basal titanosaur that lived in what is now Argentina during the Middle Cretaceous. It's remains were found in the Huincul Formation. Popularly believed to be the largest dinosaur, this title is probably exaggerated. It was reconstructed as a giant saltasaur by Carpenter in 2006, which is very unlikely, in no small part due to it's basal position within Titanosauria. It also probably didn't battle groups of Giganotosaurus as they lived several million years apart. The dorsals are based on the arrangement proposed by Powell & Salgado (2010), albeit with the anterior dorsal moved one position forward due to issues with neural spine articulation. The neck, shoulders, and distal portion of the tail are based on Patagotitan. The forelimb proportions and much of the tail were based on Epachthosaurus, while the head, tibia, pes, and cervical ribs were based on Malawisaurus. The femur length as restored here is based on a complete femur assigned to Argentinosaurus by Bonaparte (1996), and mentioned by Mazzetta et al. (2004), which proposes that the complete femur, the femur shaft MLP-DP 46-VIII-21-3 (composited with the holotype here), and the holotype specimen PVPH-1 were similarly-sized animals. The ilium and caudal neural spines were reconstructed based on Rukwatitan. 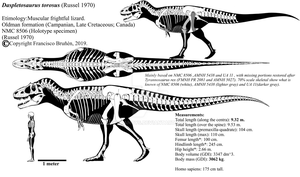 The pubis and ischium were based on Andesaurus, and the dorsal ribs and sacrals were drawn as generic elements. Left and right limbs were swapped to show off the preserved elements. Thanks goes to for his Argentinosaurus and Andesaurus reconstructions, which were used for references, and for his helpful advice, and to for his helpful advice. For an animal as popular as it is, and known from more material than more enigmatic giants like Puertasaurus reuili and Maarapunisaurus fragillimus, it sure was harder to reconstruct than they were. 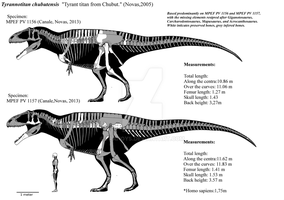 Bonaparte & Coria, 1993, "Un nuevo y gigantesco sauropodo titanosaurio de la formacion Rio Limay (Albiano-Cenomaniano) de la provincia del Neuquen, Argentina"
Mazzetta et al., 2004, "Giants and Bizarres: Body size of some southern South American Cretaceous dinosaurs"
Salgado & Powell, 2010, "Reassessment of the vertebral laminae in some South American titanosaurian sauropods"
Mannion & Calvo, 2010, "Anatomy of the basal titanosaur (Dinosauria: Sauropoda) Andesaurus delgadoi from the mid-Cretaceous (Albian-early Cenomanian) Rio Limay Formation, Neuquen Province, Argentina: implications for titanosaur systematics"
Carpenter, 2006, "Biggest of the big: a critical re-evaluation of the mega-sauropod Amphicoelias fragillimus"
Gorscak et al., 2014, "The basal titanosaurian Rukwatitan bisepultus (Dinosauria: Sauropoda) from the middle Cretaceous Galula Formation, Rukwa Rift Basin, southwestern Tanzania"
Martinez et al., 2004, "An articulated specimen of the basal titanosaurian (Diosauria: Sauropoda) Epachthosaurus sciuttoi from the Early Cretaceous Bajo Barreal Formatiion of Chubut Province, Argentina"
Gomani, 2005, "Sauropod dinosaurs from the Early Cretaceous of Malawi, Africa"
Filippi et al., 2010, "A new titanosaur sauropod dinosaur from the Upper Cretaceous of North Patagonia, Argentina"
Poropat & Kear, 2013, "Photographic atlas and three-dimensional reconstruction of the holotype skull of Euhelopus zdanskyi with description of additional cranial elements"
Wilson et al., 2016, "The skull of the titanosaur Tapuiasaurus macedoi (Dinosauria: Sauropoda), a basal titanosaur from the Lower Cretaceous of Brazil"
Carballido et al., 2017, "A new giant titanosaur sheds light on body mass evolution among sauropod dinosaurs"
UPDATE(10/11/2017): Updated due to the publication of Patagotitan. The neck and tail have been overhauled, and the anterior dorsal rescaled, causing a slight dip in the anterior dorsal centra to allow it to smoothly articulate with the others. The Phuwiangosaurus-based 1st-4th sacral fusion has been dropped. See the previous version for comparison. Previously, it measured ~13.76 metres tall, ~24.2 metres in standing length, and ~28 metres long in axial length, with a neck scaled based on Phuwiangosaurus with allometry from Parrish & Michael (2006) applied as the isometrically-scaled version was too short to make sense ecologically on an animal of this size, an issue which plagues Carpenter's 2006 reconstruction, and a tail based on Andesaurus. UPDATE(10/28/2017): Rescaled the neck, and overhauled the tail based on Epachthosaurus, which was placed close to Argentinosaurus consistently in most phylogenetic analyses that include both taxa. See the previous version for comparison. 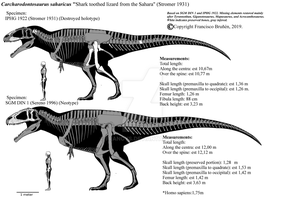 Previously, it measured ~14.47 metres tall, ~26.14 metres in standing length, and ~31.18 metres in axial length. UPDATE(5/10/2018): Added detail, remade the skull, replaced the scapulacoracoid (Malawisaurus doesn't actually preserve the scapula), and scalebar updated to my new conventions. See the previous version here for comparison. It's my reconstruction of Malawisaurus' skull. Of course, due to it's fragmentary nature causing uncertainties in size estimates. There are also very likely larger individuals of A. huinculensis than the ones we found so far, given that statistically, in absence of contrary data, the known specimen(s) would have been average or close most likely rather than exceptionally large. Undiscovered larger Argentinosaurus species are also not off the table, as well. Thank you for time. this helps me alot. can I use this as reference for a life reconstruction? It's a bit strange to see that yours represents the smallest estimate now. Not really much smaller overall, just shorter. It's roughly similar in size to many other contemporary reconstructions when you really compare their bodies in terms of overall size. Torso length should be well-constrained in Argentinosaurus given how much dorsal and sacral material is preserved and documented, so the biggest variables in length would be the neck and tail. A notable difference between mine and many other contemporary reconstructions is due to me scaling the majority of the tail based off from Epachthosaurus, which routinely ended up close to Argentinosaurus (normally one node more derived, but one node more basal popped up sometimes as well, and at least one had both taxa in a polytomy) in most phylogenetic assessments and analyses that include both taxa. There's over 20 years of time-tested consistency and repeatability right there. 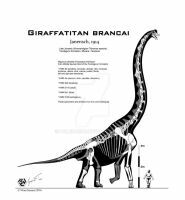 Most others, those that get the massively-long Argentinosauri, scale the tail using Patagotitan, taking the Carballido et al. (2017) analysis at face value, which I'm not very convinced of since it, as I said, generally inconsistent with the few consistent things Titanosauria had over more than 2 decades of phylogenetic analyses, and I don't think one new analysis short of the ones on the scale Tschopp and co. do would topple all that alone. Furthermore, A not-so-long-proportionally tail makes more sense IMO based on the relatively small posterior sacral centra of Argentinosaurus. Another is not scaling anything based on Rukwatitan due to the fact that they have very bad overlap, an ilium which is virtually undocumented in Argentinosaurus, only being illustrated in Kenneth Carpenter's saltasaur-clone reconstruction. I can understand shaping some elements based on Rukwatitan, which I did here, but not cross-scaling from it. Sorry Nima, I just find myself disagreeing with that part. I originally intended to cross-scale the tail based on Rukwatitan, but the realization that I have to be scaling via a very poorly-documented ilium proved too much. is that just more likely or do we have more titannosaurs with flat faces now? The skull is like that because it's inferred based on Malawisaurus. Argentinosaurus, it's what may truly be the biggest dinosaur ever. I know there are even bigger dinosaurs than Argentinosaurus, but Argentinosaurus may still be the biggest dinosaur ever (based on a journal I saw). 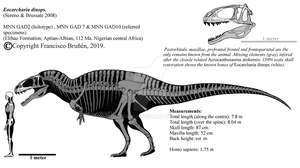 My interpretations place it at the same tier as Huanghetitian ruyangensis, GSP's referred Mamenchisaurus sinocanadorum giant, Ruyangosaurus, an unnamed MLP femur specimen (Paul, 1988), around ~50-75 tonnes, and heavily outclassed by legendary, possibly ~100+ tonne giants like Puertasaurus, "Brachiosaurus" nougaredi, Barosaurus "giganteus" (BYU 9024), and Amphicoelias fragillimus, some of which may possibly have massed around twice as much as Argentinosaurus in life, or around ~100-150 tonnes. In addition, the giant Oklahoma specimens of Apatosaurus ajax probably massed around ~50-60 tonnes and were apparently only half-grown, with adults hypothetically potentially reaching the ~100-tonne region. And not to mention the massive ichnites from Spain, Bolivia, Australia, etc. that were probably left by trackmakers larger than Argentinosaurus, some possibly even coming into A. fragillimus territory IMO. Unfortunately, data on many of those are lacking. Fortunately, Rexisto gives some figures that could be helpful in giving an idea. This one has "Huella Marueccos", a possible diplodocoid gigapod ichnite, and this one has "Mano Espana", a possible brachiosaurid supergiant ichnite, and "Bolivia Huella", a possible titanosaurian gigapod ichnite. I would also have included the Plagne trackmaker, now named Brontopodus plagensis, but that one turned out quite different (brachiosaur rather than diplodocoid ichnites) and much smaller than I previously though. There are also gigantic sauropod tracks in Broome, notably track UQL-DP8-1 (morphotype A), which probably belonged to a gigapod titanosauriform. Yeah, Amphicoelias fragilimus was considered to be even larger than Argentinosaurus, though we don't have that much fossils of Amphicoelias, the so-called "Godzilla" of the animal kingdom, but the Blue Whale is more like the "Godzilla" of the animal kingdom, due to it's much more massive size. Balaenoptera musculus isn't really the all-dwarfing giant commonly made out to be, I have to say. While the very largest blue whales known reached about ~180-200 tonnes, the average blue whale isn't that big. Average southern blue whales are about ~24.7 meters long and ~92.7 tonnes in mass according to this paper. IIRC, southern blue whales are a little bit larger than northern ones on average, so the northern average may be a bit smaller. Anyway, whales are quite compact compared to sauropods, so a blue whale won't look very "godzilla" due to it's dimensional deficiency compared to similarly-sized sauropods. Godzilla, by contrast, goes all-out in both dimensions and mass. Anyway, a few unnamed ichthyosaurs possibly got even larger than both the largest known blue whales and sauropods, but they're not very well-known. Oh, right... I forgot about the largest Icthyosaurs. Now I'm reminded of those big Icthyosaurs such as Shonisaurus and Thalattoarcon. Fleming et al., 1971, "New Zealand Ichthyosaurs—a summary, including new records from the Cretaceous"
It mentions a ~45-centimeter vertebral centrum, and some ~38-centimeter ones as well, which were described by Hector. For comparison, those of Shastasaurus-sized ichthyosaurs measured about ~20ish centimeters across. Zammit, 2010, "A review of Australasian ichthyosaurs"
It mentions a centrum of Hector's giant ichthyosaur as ~45 centimeters across and roughly twice the dimensions of the centra of Shastasaurus. Not very open-access , but you can use Sci-Hub on them. I know about the "Sea Amphi". Eh, I'm going with 30 meters and 75 tonnes until we don't find more remains. 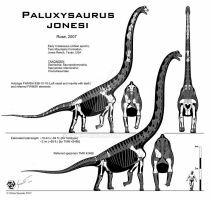 75 tonnes is well plausible, length depends on how long you reconstruct the neck and tail though. Is it within the range of 60-75 tonnes? THICC...but really, it's surprising how short that tail is. Yeah, andesaurs probably had relatively short tails, assuming 50 caudal vertebrae. This reminds me, I need to revise my Argentinosaurus... and do a Malawisaurus, or at least its skull. I have one in the works, and it's turning out rather different than Hartman's version. Novas & Ezcurra (2006) Reinterpretation of the dorsal vertebrae of Argentinosaurus huinculensis (Sauropoda, Titanosauridae). Tried it, it resulted in this happening. It really doesn't work out much, as it gets a weird back where the D4 neural spine (1993 "posterior") points cranially, then suddenly the D5 spine (1993 "D1") orients caudally. Great skeletal! Puertasaurus is considerably bigger though. though i could be mixing them up i guess. Both reconstructions have issues from what I've seen. Jona's Argentinosaurus seems to have the anterior dorsal centra too big. Scott Hartman's Puertasaurus is mostly blacked out, so you can't really see what's going on in there. Unless you scale it using the centrum length of the second dorsal, which I don't see as advisable due to the proportions of the Puertasaurus centrum, Futalognkosaurus yields larger sizes for Puertasaurus than Scott Hartman's version. Ruyangosaurus also supports larger sizes for Puertasaurus, given that it's most likely a close relative of it and overlaps with it, but shows a normally proportioned posterior dorsal centrum (contradicting what you would get if you scale Puertasaurus' dorsal column from Futalognkosaurus based on centrum length). Pitekunsaurus, another longkosaurian relative of Puertasaurus, also shows a compressed third dorsal while the 6th-7th dorsals were more elongate, and further contradicts direct centrum length-based scaling from Futalognkosaurus, and thus provides further support for larger sizes. 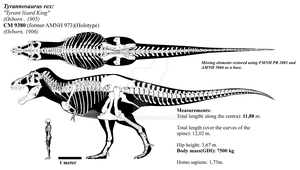 Ruyangosaurus might be a non titanosaurian Somphospondyli, not a lognkosaur like some people believe. 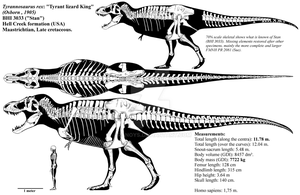 The total nonexistence of Longkosauria in their analysis. No Puertasaurus, no Futalognkosaurus, nothing. You can't get a phylogenetic analysis to place an animal in a group that doesn't exist for it. Essentially, they a priori excluded a longkosaurian affinity from the very start. Problematic and bizarre bone interpretations. What they call "posterior cervicals" look more like puertasaurine dorsals and don't look like any sauropodomorph cervical. Most glaringly, it's far too anteriorly compressed to be one, and even has the same proportions as the known Puertasaurus dorsal. The cervicals that do look like cervicals are long and shallow, like the one known from Puertasaurus. A glaring issue with their bone interpretations and reconstruction is that they give it 13 dorsals and 19 cervicals. Really, 13 dorsals, really? Not ONE known sauropod has that many dorsals, you have to go back to the basal non-sauropod sauropodomorphs to attain this dorsal count. Also, be careful of the plaster! First of all, thank you for posting the Ruyangosaurus paper; I will have to carefully read it before I can make my own conclusions. 1. The study does include clade specifiers like Andesaurus and Malawisaurus. Ruyangosaurus comes out more basal than both taxa in all their trees, so the study suggests it's probably not a titanosaur. 2. Euhelopus has 30 presacrals, according to Wilson and Upchurch (2009), 17 cervicals and 13 dorsals. Perhaps it's a basal condition amongst somphospondylans. 1. Total removal of whole clades can mess up others on the tree. No longkosaurs, no longkosaur characters, the program is going to be confused by the Ruyangosaurus' features. Not to mention that the whack bone interpretations (e.g. dorsal that resembles Puertasaurus' 2nd dorsal placed as a cervical) would also significantly affect how the characters are interpreted and coded. Both of these would work in conjunction with each other to seriously affect the analysis. Neither Andesaurus and Malawisaurus are longkosaurs, so they don't function as specifiers for that. 2. I may need to check more on Euhelopus sometime. I thought it had 18 cervicals and 12 dorsals? Interesting observations. The dorsal vertebra do look more "advanced" titanosaur like than somphospondyli, and the new dorsals look to be from the same taxon as the holotype. Some of the appendicular elements, like the scapula, do not look like titanosaurian, but more like euhelopidids. Along with Yongjinglong, there seems to be a variety of titanosaurs that got to Asia during the early-mid cretaceous. The 13 dorsals are from two different individuals, and some of the positions in their ordering are wrong in the paper. Hell, the referred femur doesn't even look like the holotype femur! Some of the referred material looks like it came from a different genus, different family altogether. Also, be careful of the plaster! Yes there's a LOT of speculative plaster on those bones to make the neutral spines and other missing parts look like a euhelopodid. Funny because NONE of them have a hypantrum-hyposphene complex like you'd expect in euhelopodids and other non-titanosaur somphospondyli. In fact most basal somphospondyls are notorious for having the widest hypantrum gaps of ANY sauropod. In the cloverly Sauroposeidon the gap is almost wider than the prezygs themselves, and in "Huanghetitan" ruyangensis it's big enough to fit a grapefruit in there. 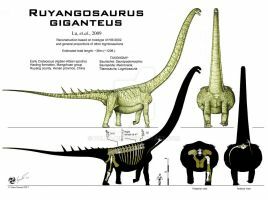 And yet Ruyangosaurus has no hypantrum at all! That would be quite a sight indeed. Well we went very down from "40 meters"
Brazilian Wikipedia still says it was 45m long and 21m tall, believe it or not.